We have been able to cater the needs of the clients by offering GPPS Black Granules.With our uncompromising commitment towards quality, we have recognized as an eminent manufacturer, supplier and exporter of GPPS Granules. These granules are precisely Processed by making use of optimum quality GPPS materials, and sophisticated techniques in conformity with set international quality standards.These granules are suitable for injection and extrusion processes. 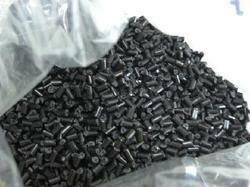 The offered granules are used for making the packaging films, hospital products, etc. Acclaimed among customers for their dimensional accuracy and effectiveness, these granules are available in the market at industry leading prices. We pack these GPPS Grinding Granules in various sizes and quantities. We are engaged in bringing to the clients superlative quality Polystyrene Granules. The range of Polystyrene Granules is made from the finest quality raw materials. We procure the best quality Polystyrene Granules from reliable vendors across the country. Highly appreciated for its clarity and ease of processing, the Polystyrene Granules is highly appreciated by clients. · Crystal wares, mugs, trays, blows, pen stands, fruit bowls, service trays, thin walled cups. · Tooth brush, tooth brush containers, lay flat boxes, ball pen barrels, geometric appliances etc.